A commemorative exhibition for the 100th anniversary of the 1 March Independence Movement, ‘Waiting for Flowers’ in memory of the independence patriots was held on 2 March. The exhibition was curated by Seo Hae-Sung (Chief Director of the exhibition) and Bae Dari (Director) as part of a project to commemorate the 100th anniversary of the Independence Movement, hosted by the Seoul Metropolitan Government and jointly designed by Wee Jinbok (UIA), Hong Kyu (AQ studio) and Lee Seung-yeop (ARCH166). 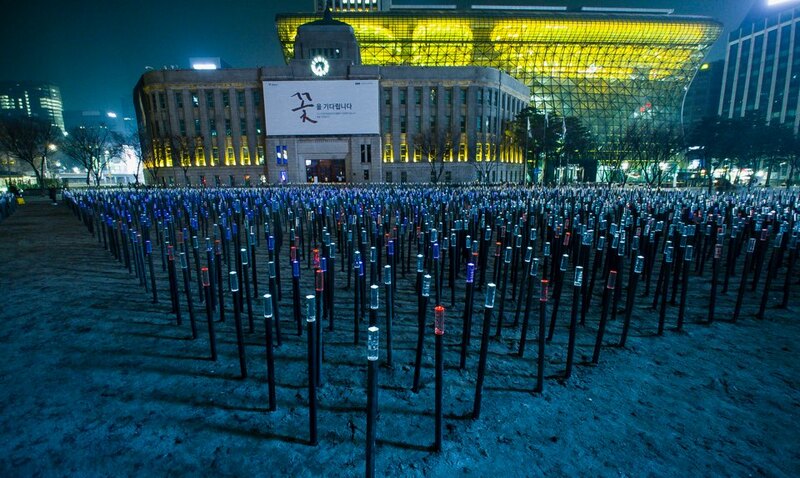 As visitors enter the square, thin, long black columns forming a cluster occupy the sand floor. The height of the columns ranges from a person's height to their waist height, and each column has the name, year of birth, and year of death of each independence patriot in the acrylic on the top. Patriots who died without a name had the name of the exhibition inscribed into the post. The names of well-known independence activists such as Yoo Gwansoon and Kim Koo also caught the eye. ‘We wanted to express the Milky Way by thinking of those who are currently alive, those who have died, and those who don't know their names as starlight', said Wee Jinbok, Hong Kyu and Lee Seung-yeop. The individual columns consist of three elements. A black pipe representing the people rising from the floor has been installed on the square, an acrylic cylinder representing the patriot is assembled on top of the tube, and LED lights are mounted to represent each column as starlight. Lighting colours were extracted in red, blue, and white to match the colour ratio of the national flag. Citizens walked between the columns, reciting their imprinted names, written letters, hung roses on the pillars, and engraved the 1 March Independence Movement with the independence patriots in their respective ways. The exhibition ended on 8 March and they are currently planning a tour.